Cameron Ferguson isn’t the type of bloke to beat around the bush. He’ll tell you he was born without his right arm and it hasn’t held him back. He had his first sit on a horse at age three and spent his childhood and teenage years riding through the bush at Samford, West of Brisbane, with his mates. “Mum and dad never wrapped me in cotton wool, they encouraged me to get out there and have a go and that’s what I’ve always done,” Cameron said. At age 16 Cameron experienced a defining moment when one of his older friends, Peter Biggs, returned home from Longreach Pastoral College. Cameron was watching him shoe a horse and joked that he could do most things but not that. Peter scoffed and told Cameron to be at his front gate at 6 o’clock the next morning and he’d show him otherwise. Cameron learned to shoe a horse with one arm as a teenager. After high school Cameron completed a Diploma of Applied Science majoring in grazing and animal production at the University of Queensland. By his second year he was giving shoeing demonstrations to the horse husbandry students and helping them break in their horses in his spare time. Once he graduated he went to work on a station at Longreach and was again fortunate to come across another great horseman to learn from in Ray Langdon. Over the next few years Cameron made a name for himself shoeing, breaking in and educating horses. He also ran a successful rural fencing business. He picked the brains of every horse practitioner he came across and continued to study whenever he had the chance. Eager to further his knowledge and experience, Cameron became a swabbing official for Queensland Principal Club (now Racing Queensland). He took the opportunity to train as a cadet steward and also worked as the clerk of the scales at tracks all over the state. 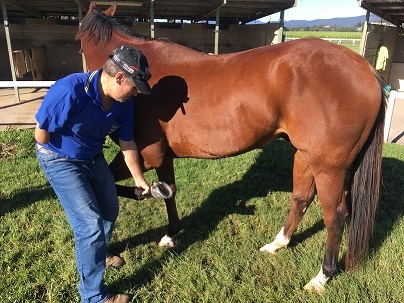 Since then Cameron has steadily built a client base around the Northern Rivers of the New South Wales and in South Eastern Queensland as more trainers embrace his holistic approach to the wellbeing of horses. Cameron at Canterbury races recently. 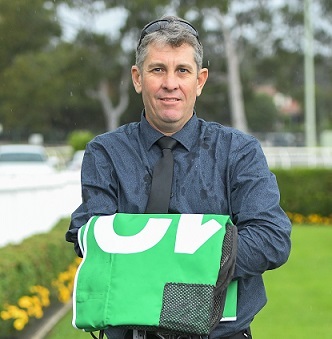 Boutique Murwillumbah trainer Liam Munro is one of Cameron’s greatest supporters and describes him as having “a marvelous gift.” Of Liam’s last 12 starters, five have recorded wins and he says he wouldn’t have achieved those results without Cameron’s help. Liam was advised to retire two of his horses, Chloride and Fell From Heaven, towards the end of last year. Chloride had bowed a tendon and was suffering from psychological issues. Fell From Heaven had come down from across the border after being declared the maddest horse on the coast. Fell From Heaven has won two races and Chloride three since Liam was told to retire them. “Instead of pulling out a bigger stick, it’s better to try and figure out what’s wrong,” Cameron said. “Natural horsemanship techniques have been scoffed at for too long. This story was originally published in the July 2018 edition of Racing NSW Magazine.